You are here: Home / Uncategorized / Let The Croatian Bells Wake Us All Up! The Croatian Bells (Hrvatska zvona) association was founded and registered in June 2017 in Siroki Brijeg, Bosnia and Herzegovina, and its main focus and principles are in the promotion of the Homeland War, the cultural and historical idetity of the Croatian people. It was founded with the mission of promoting the values of the Homeland War, the promotion of general well-being and the well-being of all human beings, the promotion and nurturing of Christian points of view, moral principles and democratic values, advocating for family and other social values, advocating for demographic renewal and the return of Croats from abroad, the promotion of peace and coexistence with other peoples in Bosnia and Herzegovina and across the world, connecting Croats in Bosnia and Herzegovina and Croatia in economic, cultural, scientific and every other sense, the retention and the nurturing of the Croatian cultural heritage (verbal and written), the nurturnig and preserving of native identity of the Croatian people, advocating for the rights of the Croatian veterans in Bosnia and Herzegovina and Croatia, advocating for the rights of the families of those veterans who were killed, imprisoned or are missing. An article published by Croatian Bells association 3rd April 2018 was brought to my attention and given that it contains a Holy Easter message by Dario Kordic, former vice president and a member of the Presidency of the Croatian Community of Herceg-Bosna, and later Croatian Republic of Herceg-Bosna (early 1990’s) I have translated the article into English for the benefit of the non-Croatian speaking world for whom the truth about the struggles and sufferings of the Croatian people in Bosnia and Herzegovina during the 1990’s war and after – is of paramount and significant importance. “And Dario Kordic is with the Croatian Bells! Dario Kordic is already a symbol of the ups and downs of the Croatian people. At the beginning of the nineteen nineties he led the Croatian people of Central Bosnia into the dawn of freedom, and then into the defence for their survival in the onslaught of Serb, and then Muslim aggression. Instead of enjoying the fruits of freedom defended with blood, precisely because of the defense of the freedom of his people – martyrdom and a process of a guilty verdict followed precisely because he refused to be a slave. His life witnessed the downfall of international justice and fairness, the shakiness of Croatian statehood, and the martyrdom of contemporary Croats in the Hague Tribunal and the persistent persecution by certain elites in Croatia and so-called Croatian representatives in all public institutions, especially in the media. Coming out of incarceration (2014) he devoted his life to the reaffirmation and witnessing of the fundamental Croatian national pillar, Christian spirituality and virtuous identity and symbolism. He is an ordinary Croatian man. A husband and father who has been denied the right to witness the growing up of his children as has been denied to thousands of others, whom he calls upon today to follow the message of Risen Christ and not to abandon oneself to fear. For, Dario Kordic was never afraid of evil or knelt before fear. ‘In the blessed atmosphere of the Resurrection of the Lord, a group of warriors from Herceg-Bosna, feeling all the pains of tears, suffering and tests endured by the severely wounded Croatian national being in Bosnia and Herzegovina, firmly decided to engage in an unstoppable process of major changes at the dawn of coming elections of Croatian legitimate representatives in Bosnia and Herzegovina. The honorable names of Zlatan Mijo Jelic, Zeljko Glasnovic, Marko Tokic, Marko Rados, Zdenko Juric Major, Ranko Rados, myself and many others will act like icebreakers that will clear the path for hundreds of young intellectuals, workers, students, children of the defenders of the HVO (Croatian Defence Council) to stop the Croatian people from being pushed into the abyss. The most fatal of sins are corruption, nepotism and the employment of only the suitable in public companies with the Croatian Hercegbosnian sign. Sins are those who tremble to heaven. They are the most important reason for the exodus of thousands of Croatian young men and girls, as well as a multitude of Croatian families from the Herceg-Bosna soil. Such are also the grave failings of the promises for the betterment of the disgraceful status of the Croatian defenders and the invalids of the Homeland War disfigured by the massacre perpetrated by the previous authorities which were not of the people. Particularly painful are the decades long persecutions of Croatian war veterans accused of war crimes. They are literally being hunted like beasts. The use of double, i.e., harder criteria for the HVO members as opposed to criteria used for members of the BiH army, because the former are judged by the political qualifications of so-called ‘criminal enterprise and command responsibility’, is unacceptable. 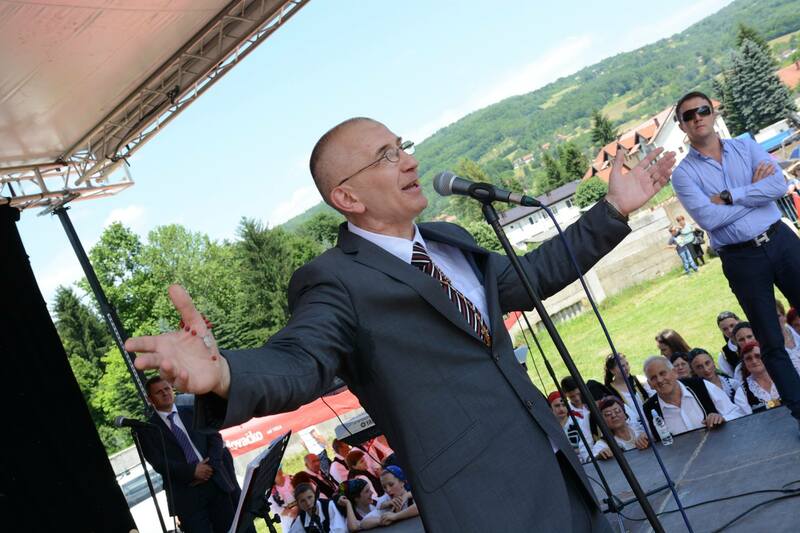 We should rapturously pray to the Savior that the Croatian people in Bosnia and Herzegovina will build their future on the younger generation of Croatian politicians who will serve their people who have suffered and be guided by determination, honesty and knowledge. Hundreds of Croatian young women and young men gathered around the newly established ‘Croatian Bells’ association shall carry the new spark with pride and courage. We shall build together all the honourable Croatian patriotic forces of various party roles throughout Herceg Bosna. It will then be much easier to find a fair political solution for the constitution of Bosnia and Herzegovina as a state of three constituent and sovereign peoples. For this – faith is necessary before anything else! FAITH! Along with it, the long suppressed and almost extinguished elation that adorned us in the nineties will also come. Most of us Croatian warriors thought that we would never again be included in some new projects of Croatian strategic importance. But persistent calls and requests from numerous Croat youths from BiH and the diaspora have thrust us to the defence-from-lightning post so that fear would no longer live among Croats in BiH. And there is too much fear from the current Croatian leaders who give out crumbs from the table to the people, threatening to deny them even that if they don’t follow them faithfully. Oh my God, my beloved God, how the dignity of the Croatians in Herceg-Bosna has been trampled upon, battered, and humiliated. This Easter Hour announces that among the Croats in BiH evil will no longer be promoted as a value, as good. Truly, the time of grace is coming where love and hope will flow enormously like rivers flowing through the Croatian Herzegbosnian valleys. The truth is that for a real democracy you need to keep the church and state separate or else you don’t have true democracy. In which you have freedom for all and all the options and opinions that go with it not just a Christian or Catholic one. Long live a FREE and Democratic Hrvatska! Given that you love Croatia so much, why don’t you actually live there and share its fate? AOC protest on it’s AWOLL. Looking at the history of corruption better details the plight of today. I love your blog! Thank you for your kind blessings sent my way! You’re welcome, Ina. I just ran out of time for writing. Company stopped by this evening. ❤️ Hope your week goes well.